Learn why security analysts dubbed the new Anatova ransomware revolutionary in several ways and get the hang of techniques to remove and decrypt this strain. With few exceptions, the crypto ransomware climate has been fairly dull for a year or so. The progress of this cybercrime domain hasn’t stopped to a halt, though. The recently discovered Anatova ransomware is irrefutable evidence of this. While going the down the well-trodden road of extortion, it appears to have unparalleled capabilities hidden underneath a layer of vanilla external manifestation. It turns out, the adverse repertoire of this sample includes a few interesting quirks, such as modular design and prevention of reverse-engineering attempts. Combined with competently written code and properly implemented cryptographic standard, these traits make the Anatova virus one of a kind. Furthermore, its executable was reportedly compiled in 2019, and it looks like an independently crafted sample operated by a new crew of online malefactors. Contrary to most pieces of ransomware out there that engage malspam, exploit kits or RDP hacks, this one is propagating via peer-to-peer networks. As uncommon as it is, this vector has apparently resulted in a bevy of installs for the distributors. According to some publicly available statistics, the crooks have made hundreds of victims in the United States and a number of European countries over the course of the first outbreak. The bad program is masqueraded as a benign application or video game. The booby-trapped installer is executed without consent and awareness of the user who thinks it’s a great new app they are getting. One of the most disconcerting properties of the Anatova ransomware’s behavior after contamination is that it goes ruthless on Volume Shadow Copies of the victim’s files, wiping them up to a dozen times. This is a serious obstacle to forensic recovery of the data. Another serious wakeup call is that the culprit leverages the “vssadmin” tool to do it, which means it gets administrative privileges on the host while circumventing permission request proper. The encryption algorithm in this scenario is the Salsa20 stream cipher. In order to complete the cryptographic part of its mission, Anatova skips files larger than 1MB and ones located in paths that are important for the operating system to run smooth. Unlike garden-variety blackmail programs that append certain extensions to ransomed files, this sample does not alter the original filenames at all. That’s only the tip of the iceberg, though. 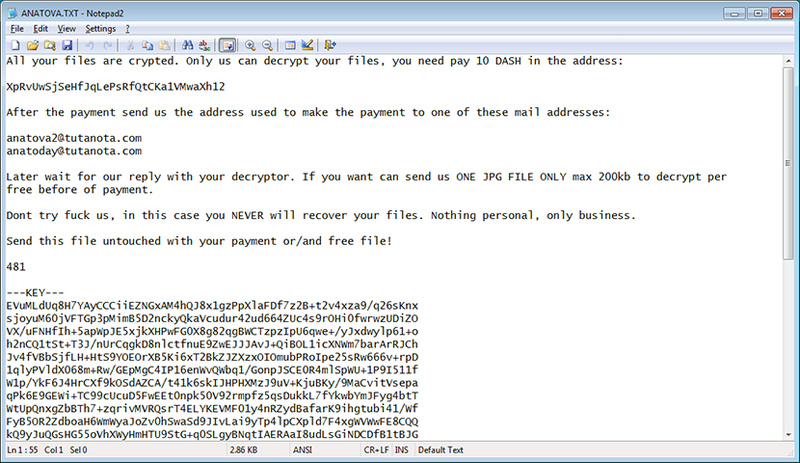 The ransomware does make changes at a deeper level of file structure that’s invisible to the naked eye, yet identifiable by the malicious code. Specifically, it adds markers that prevent double encryption, a redundant thing for this type of malware that badly relies on lightning-fast attack routine. As part of the raid, the Anatova ransomware leaves a rescue note behind. It is named ANATOVA.txt, and it will only appear inside directories with at least one encrypted item in them. This document instructs the victim to send an email to anatova2@tutanota.com or anatoday@tutanota.com, indicating the unique hexadecimal key from the note along with the address of outgoing payment for the decryptor. The ransom amounts to 10 DASH, worth 712 USD at the time of this writing. As mentioned above, the Anatova virus features an analysis prevention mechanism. Its implementation is as follows: having made it into a host, the infection fetches the victim’s username and compares it against a predefined list of strings, such as “Lab”, “Tester”, “Malware” and a few more. The thing is, security researchers often include these terms as part of their usernames on a virtual machine used for code testing. If a matching item is found, the ransomware ceases the incursion in an attempt to keep itself from being reversed and extensively analyzed from different angles. To top it all off, this infection potentially supports extra components as it goes with two DLLs. Although these files are functionally blank at this point, they are clues that this malicious entity is modular therefore the ransomware may assume additional characteristics further on. For instance, it may steal data or promote other malware before actually encrypting data on a target computer. Obviously, the Anatova attack is a serious quandary. Keep reading to get an idea of how to sort it out. Some ransomware strains terminate themselves after completing the encryption job on a computer, but some don’t. Furthermore, the Anatova blackmail virus may prevent victims from using popular antimalware tools in order to stay on board for as long as possible. Under the circumstances, it may be necessary to utilize the Safe Mode with Networking or System Restore functionality. Not only are you a lucky person in case you’ve been backing up your most important files, but you’re also a wise and prudent user. This isn’t necessarily a resource-heavy activity these days – in fact, some providers of online services are allocating a sufficient size of cloud storage space for free so that every customer can easily upload their critical data without paying a penny. Having removed the Anatova ransomware, therefore, all you have to do is download your stuff from the remote server or transfer it all from an external piece of hardware if that’s the case.